Jakarta, March 3rd 2015 - After the success of Indonesia’s first Alana Hotel in Surabaya, Archipelago International now has its sights set on Yogyakarta for the growth of its contemporary 4-star Alana brand, with the unveiling of The Alana Hotel & Convention Center – Yogyakarta. With a number of modern meeting rooms and MICE facilities as well as the largest ball room in the area, the hotel will be the biggest convention center hotel in the region and further establish Yogyakarta as Indonesia’s best convention destination after Bali. Alana Hotels, which take their name form the Hawaiian word for “precious”, are a brainchild of Archipelago International, the Indonesian-based hotel operator with Hawaiian roots well know for popular hotel labels as Aston, favehotel, Hotel NEO and HARPER. Conceptualized as sophisticated yet friendly 4 star designer hotels, the Alana brand offers both style and unprecedented levels of service to its guests. Bringing the signature Alana feel to the city, The Alana Hotel & Convention Center – Yogyakarta will be located within Mataram City, Yogyakarta’s most ambitious mixed-used development complex which consists of the Alana Hotel, its top notch Convention Centers and a lifestyle mall. Easy to access, the hotel is also conveniently close to Adisucipto International airport, Borobudur, Jalan Malioboro and the city center. The hotel will feature 265 rooms and suites over three room types, each one adorned with a timeless contemporary design that captures an admiration for Javanese traditions. For meeting planners and large scale event organizers, the convention facilities include 10 meeting rooms and a superb ballroom that can accommodate up to 2000 persons. For both business and pleasure, the hotel will also boast a coffee shop and a lounge, as well as an outdoor swimming pool, a spa and a gym for downtime. “We at Archipelago International are thrilled to open the largest convention centre hotel in Yogya and strive to provide the perfect setting for a mix of business and pleasure. In addition to this beautiful property, we also have two large scale Alana Hotels in the pipeline for Bogor and Solo set to open towards year end of 2015.” Said Ms. Tenaiya Brookfield, VP of Sales & Marketing at Archipelago International. 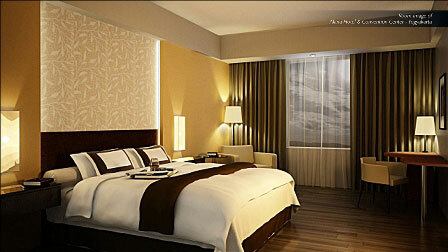 Seen in the image : Room of The Alana Hotel & Convention Center - Yogyakarta. 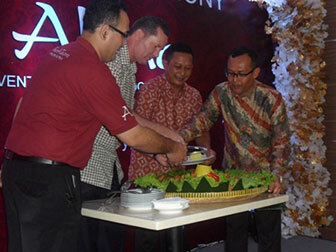 Seen in the image : Soft Opening Ceremony of The Alana Hotel & Convention Center - Yogyakarta, from left to right : Mr. Indra Siswanto - General Manager of The Alana Hotel & Convention Center Yogyakarta, Mr. John Flood - President and CEO of Archipelago International, Mr. Hari Hardono - Commisioner of PT. Saraswanti Indoland Development, Mr. Bogat Agus Riyono - President Director of PT. Saraswanti Indoland Development.